A genuine innovation of Dr Paul and Karin Herzog Laboratories, this lifting treatment combines the benefits of active oxygen with those of hyaluronic acid for a spectacular anti-wrinkle effect. Incredibly effective, this complex regenerates the skin, firms the epidermis and redesigns the facial contours. Immediately after the first month of application, the skin regains all its youthfulness. Day and/or evening and without massaging it in, apply a thin layer of Oxygen Hyalu Lift all over the face or particularly over the parts of the face to be treated. This fluid anti-wrinkle cream has a high penetrative power and will be absorbed rapidly. 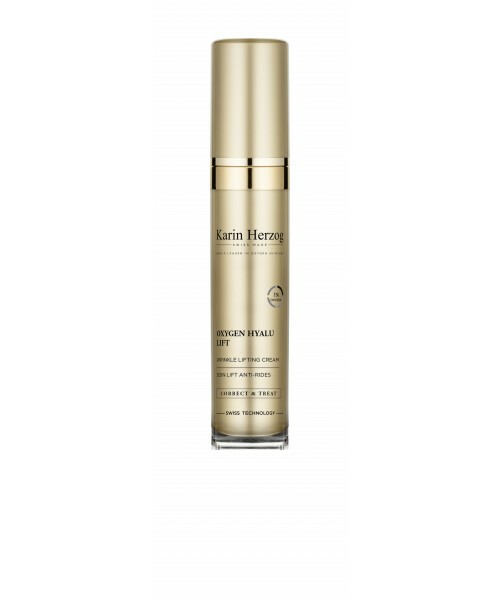 In the case of dry skin, during the winter and whilst the skin is normalising, apply a Karin Herzog comfort and protective cream, like "Additional Sweet", "Day Protection" or "Vitamin H" on top.